Let's be real, no one likes having greasy hair. Although I know that it's not healthy to wash your hair as often as I do, I don't feel like I can just wash my hair less because it becomes so greasy that sometimes I just can't stand it. However, I've recently been getting better about taking care of my hair so that I can comfortably go without washing my hair for 2-3 days. I'm working on extending that time, but it's a process that takes some time to get used to. In the meantime, while I'm trying to stretch the days go by without washing my hair, I've been trying to still maintain some semblance of clean hair, which brings me to these tips, some things that I've noticed have been helpful to me in dealing with oily hair. Apply dry shampoo at night. 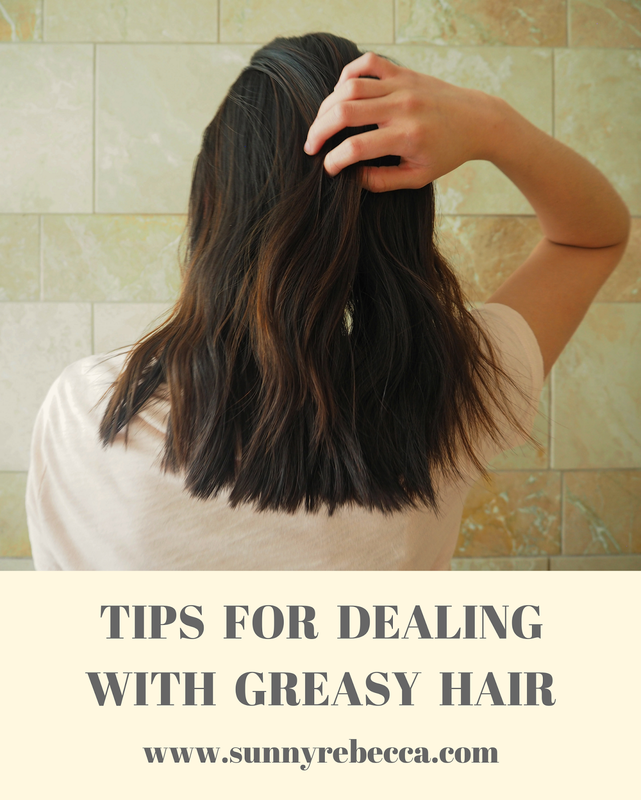 This is probably the most obvious tip for dealing with greasy hair, except the thing is, dry shampoo is not most effective when you apply it on already greasy hair. I've found that it does almost nothing whenever I apply it on my hair that is already greasy. It's best to apply it at night while your hair is still generally clean and has not built up much grease yet. After applying it, while you're asleep, the dry shampoo can not only disperse throughout your hair, getting rid of those white spots, but it also absorbs the grease as it builds up so that when you wake up, your hair is still nice and fresh. It's a bit more unconventional, but I think that corn starch is the best way to deal with greasy hair, at least for me. I put some corn starch in a small tupperware in my bathroom and I use it every other day. Corn starch can be substituted for dry shampoo and you can just put it on like any powder dry shampoo. Since it's light colored and I have dark hair, I always apply the corn starch to my roots at night, before my hair has built up much grease. In the morning, when I wake up, my hair is still fresh, almost like first-day hair. If there are still white spots, I simply add a bit of water to my roots to get rid of it. However, I've heard of people using cocoa powder as dry shampoo with darker hair colors, so you can try mixing corn starch and cocoa powder if you please. I personally have not tried this before, but a friend of mine has and said that it really helped with her greasy hair. Try a shampoo that is made with natural, maybe even organic ingredients. She even washed her hair with baking soda and apple cider vinegar once! Most shampoos have a ton of chemicals in them that can potentially be damaging to your hair. Try out more natural products or even DIY shampoo alternatives. If DIY shampoo alternatives are too much for you, maybe just try them out sometimes, once a week. Did you know that touching your hair can actually make it more greasy? The oils from your fingertips can transfer to your hair when you touch it too often. In order to refrain from touching my hair, I like to braid my hair after washing it. When my hair is away from my face and contained, I'm less likely to touch it as much, resulting in less greasy hair. I find that when I braid my hair after washing it, my hair is still pretty fresh even after two or three days. Using a dirty hairbrush or a hairbrush full of hair can actually transfer the grease from past brushing onto your fresh hair. Clean your hairbrush, get a new one, empty out all those hairs from it, so that when you brush your hair, it's completely clean, stopping other products and additional oil from getting onto your fresh hair. It's LIFE CHANGING! Most tricks online have not worked at all for me, dry shampoo did nothing until I put it on at night. Total game-changer! Hope it works out for you!